I know I’ve mentioned things that we’ve been up to or what’s been going on in our lives, but I guess I never really mentioned anything concerning (you guessed it) food! Some sort of fried eggroll(?) meal. I don’t know, it was really good though! Some sort of noodles meal… I don’t know, it reminded me of stir fry, it was nommy. Pork! I think pan fried maybe? It was so good. I forgot the fish, mackerel I think?? One of our favorite places to go eat in Totsukawa is a small and local restaurant very close to the apartment. The restaurant is called Cafe Pit and they specialize in an amazing curry menu that just makes us want to take a nice long nap every time after we eat there. The lady who always seats and serves us is very sweet, and their menu is small, but simple. We usually stick with getting the same meal we usually get because it’s just so good. 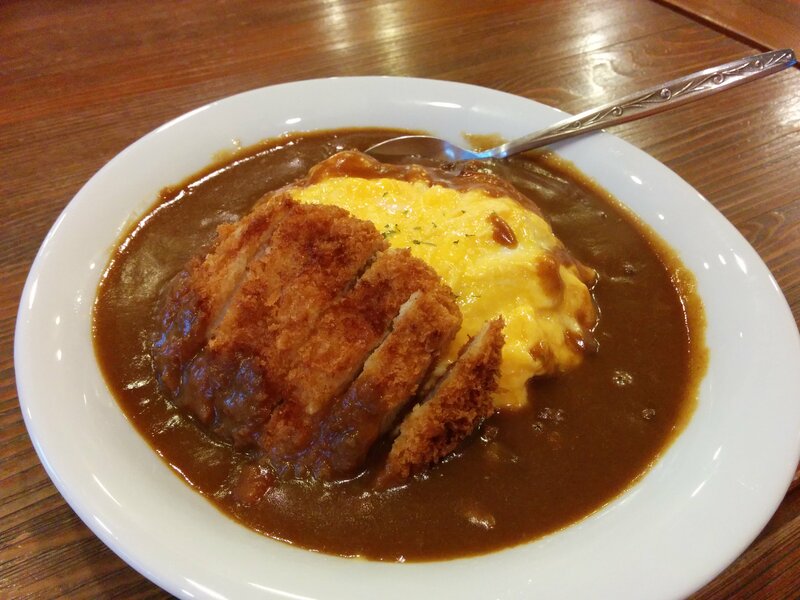 This dish is Trevor’s go-to meal: カツの生, which is オムライス(ketchup rice wrapped in an egg omelette) with fried pork cutlet on top of curry. YUMMMM. 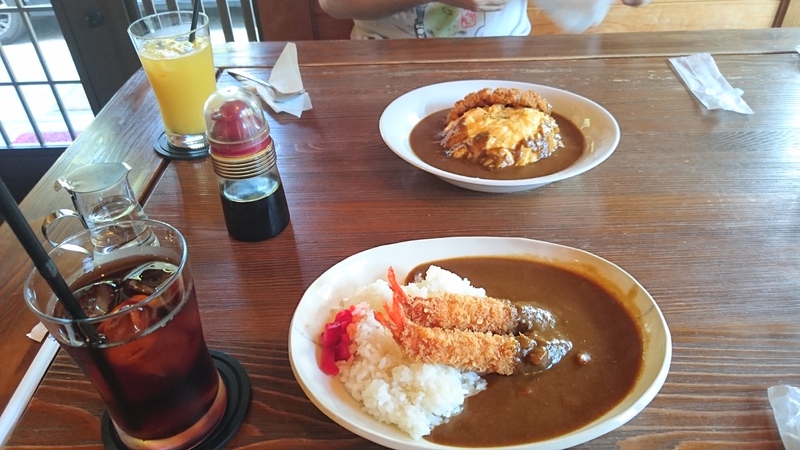 Trevor’s カツの生 in the back, and my go-to meal in the front: えびカレー, shrimp fry with rice and curry. I also usually get some iced lemon tea with my meal ^^ Trevor sometimes gets orange juice. 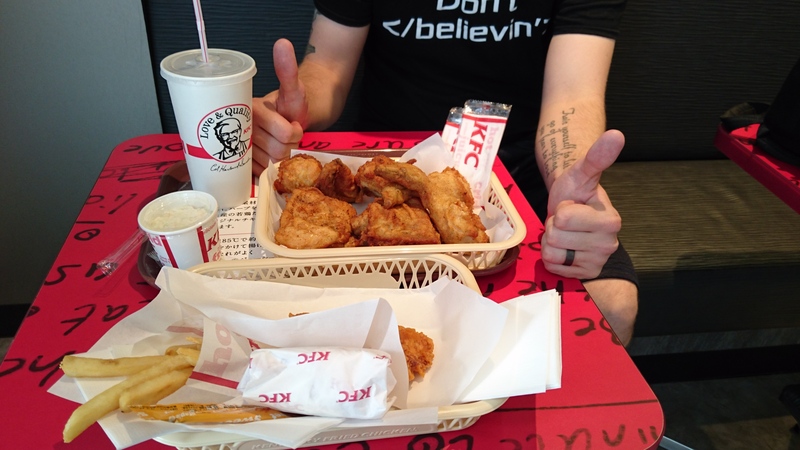 When it comes to fast food, there is more to Japan than just the unusual items at McDonalds! We haven’t been to too many fast food places, but here are a couple that are familiar and awesome. On the bright side, we found a burger joint that is waaaaay better than McDonalds or any other chain burger place! Presenting… Freshness Burger!! This restaurant is located in the Kashihara AEON mall, but placed conveniently away from the busier parts of the mall with screaming children everywhere omg It’s a pretty cool feeling when you first discover the place, its almost like finding a secret map in an RPG game. 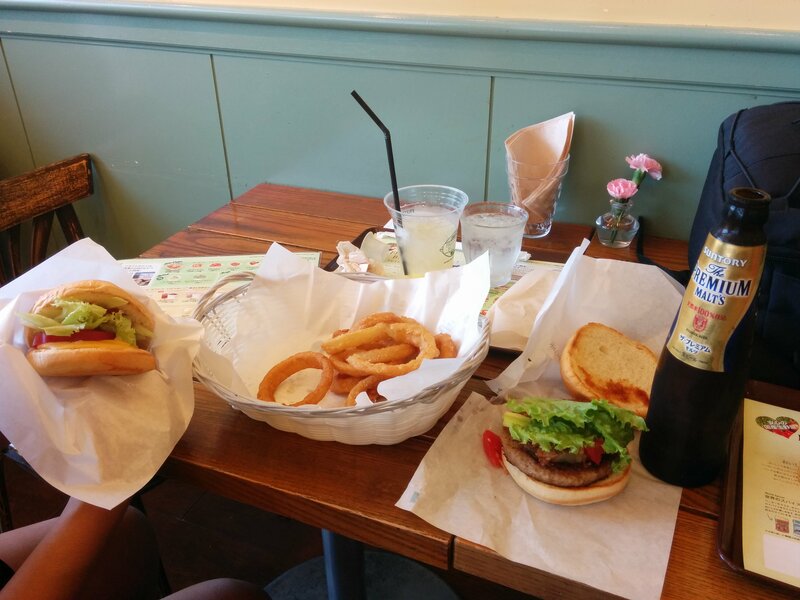 Burgers, onion rings, lemonade, and beer? It’s a good day. They have quite a variety of burgers on their menu, with an English side at the front counter as well! We highly recommend trying this place out. It’s so good!!! If anyone truly knows me, they know that I love snacks. I don’t know if it’s from being raised in a household where every meal time had an assortment of dishes to pick and choose from, but growing up, it was always much easier for me to make a meal out of snacks than actual meals (bad habit, I know) The teachers at both my SHS and JHS actually offer me a lot of snacks and me being me, I usually just devour them on the spot and forget to take a picture… but here are some of the nommy snacks I had the patience to take a picture of! Closer look at the sand cookie. It was really nommy!! Goofy packaging, but a really nommy ice cream cone!!! This month, Baskin Robins has a Halloween menu, so I couldn’t resist. Got myself a little mouse with a cute hat. He was delicious! One of my favorite ice creams I have eaten in Japan: A monaka ice cream with banana ice cream and a chocolate bar in the middle! OMG IT WAS SO GOOD. One of the things I really miss from home is my family’s cooking. 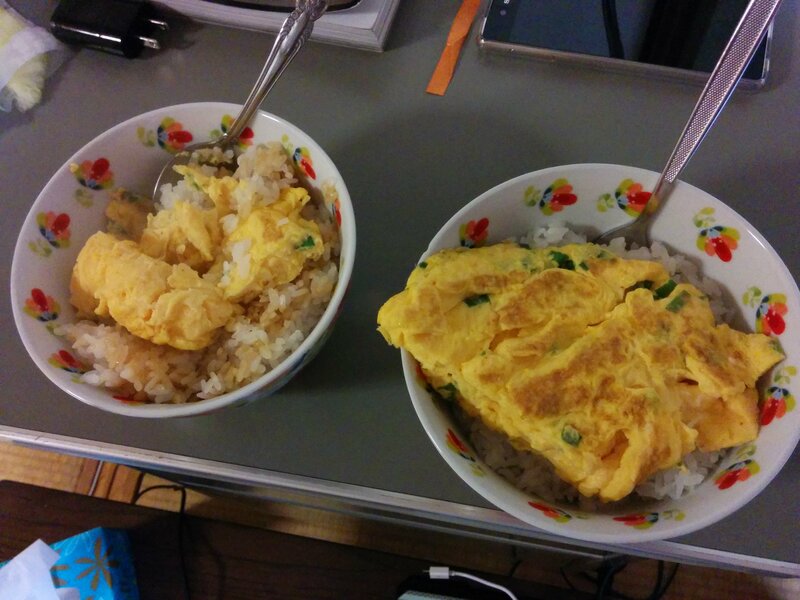 I try my hardest to replicate the way my Dad made egg omelettes. I think it turns out nommy!! Trevor put together a Shrimp Fry and Curry meal (Cafe Pit style!) 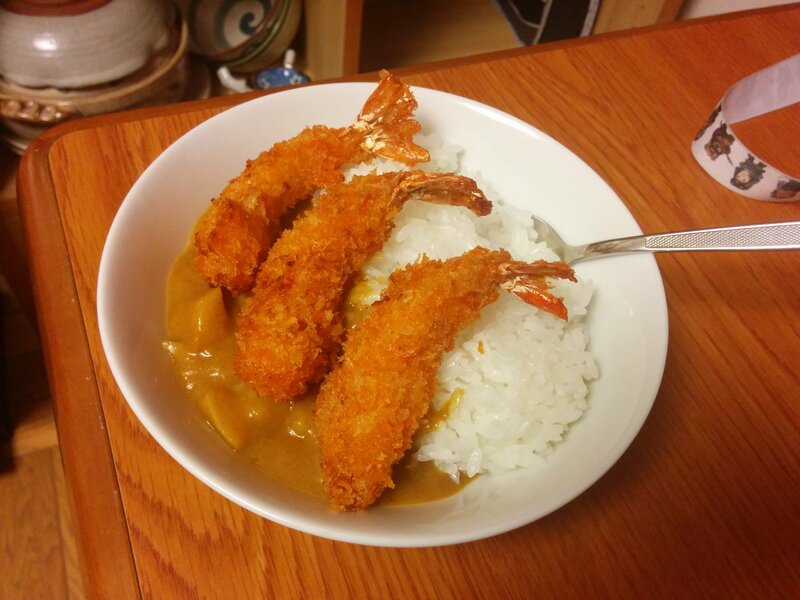 We bought pre-made breaded shrimp and he fried it up and put it together with some curry. Really good!! We’ve also made curry, pasta with garlic toast, grilled chicken and pork, and oven-roasted chicken drumsticks and wings. Yuuummmm. So there you have it, some of the foods we’ve had while living in Japan! Hope you aren’t too hungry! Yes, and they’re all very delicious! I hope you get the chance to try them out!